Details about Insta Sweep - The Amazing 3 Way Cordless and Hard Surface Spin Sweeper, NEW! 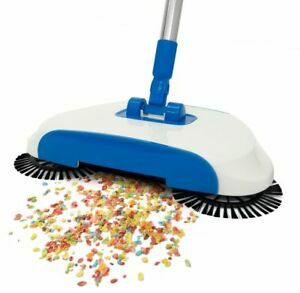 Insta Sweep - The Amazing 3 Way Cordless and Hard Surface Spin Sweeper, NEW! Immediate payment of C $14.99 is required. I really like this. It is fun to use and easy to clean. I have lower back problems and it alleviates having to do the whole dustpan thing. The construction is very basic and I would think that the price could be cut in half once it catches on, however $20 nowadays is not too bad. It is easy to assemble. The only downside is that I have 2 cats and I have to manually pull the cat hair out of the big roller brush. Not a big deal. I think you would be happy with it if you decide to buy it. We sprinkle salt on our paths to melt ice to prevent falls. Of course it tracks in the house. The insta sweep picks picks it up. I don’t like sweeping which my wife usually does. When she heard the noise the sweeper makes she asked what’s that noise? Me sweeping. Whaaat! Not bad for in between vacuuming. Does not get into corners. Cheap construction. I had to tape the handle to the head to attach it.